Burlington--From April 11-22 shoppers at Tractor Supply Company (TSC) stores throughout Vermont are invited to purchase paper clovers at checkout to show their support for University of Vermont (UVM) Extension 4-H.
TSC stores in Montpelier, Morrisville, Newport, St. Albans and Shelburne will participate in the semi-annual 4-H Paper Clover Campaign, a partnership between the National 4-H Council and more than 1,600 TSC and Del's Feed and Farm Supply stores in 49 states. Since 2010 more than $13 million has been raised nationwide for 4-H through this campaign with $981,000 collected in the most recent campaign in Fall 2017. Shoppers may buy a paper clover for $1 or more at the register with proceeds from each sale used to fund 4-H leadership programs in the county where the store is located. A small percentage goes to Vermont 4-H to support statewide programming. Donations also may be made at checkout when purchasing items online at www. tractorsupply.com. These donations will be distributed to states based on the shipping location. 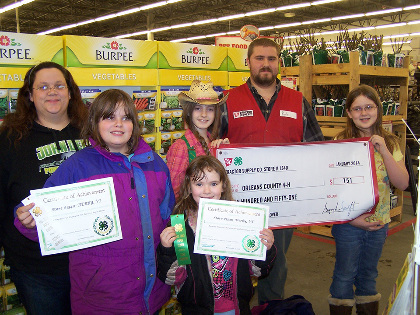 Many 4-H clubs actively participate in these campaigns by setting up displays or speaking with customers about their 4-H club work and activities. 4-H alumni are encouraged to stop by to reconnect with 4-H and learn about current programs and volunteer opportunities. To learn more about the campaign, visit www.tractorsupply.com/4-H.